Okay, there’s been a lot in the media lately about fasting. Here’s my take on it based on research and what I learned at Food As Medicine. There are amazing immune and cardiac benefits to fasting, in addition to weight loss. But, you must do it correctly. The benefits are so startling it is worth considering incorporating fasting into your lifestyle as a routine practice. The type of fasting I will talk about here is INTERMITTENT fasting, and specifically, the kind that only goes for 15-18 hours. According to the latest research, you get most of the benefits of a fast without the torture of not eating for long periods without eating. 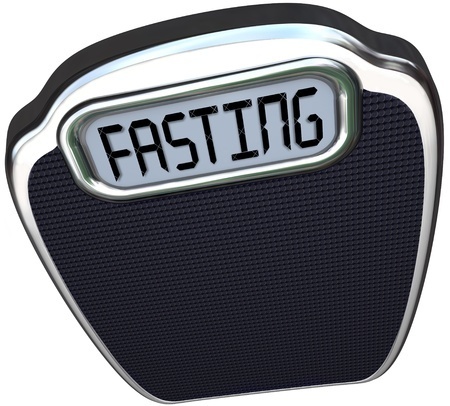 People who intermittently fast get benefits in 14-18 hours. Here’s why: increased Autophagy. Autophagy is a normal physiological process in the body that deals with destruction of old/damaged cells and removal of unused proteins in the body. This increase in autophagy was common in our ancestors, who routinely had periods of fasting due to lack of food sources. In today’s society, we can eat 24/7. Without this “down time”, our systems don’t go into autophagy enough. Fasting promotes this, and depriving ourselves via fasting twice a week could significantly lower the risk of developing Alzheimer’s disease or Parkinsons. Pretty amazing! So, the bottom line is try to incorporate intermittent fasting into your lifestyle for weight loss, wellness, immune strength and longevity. Eat clean when you do begin again. Start with as many hours (up to 18) as you can do, you can build up a tolerance. Don’t forget to drink tea or water during your fast, this helps keep you hydrated and will make the fast easier. Staying hydrated helps your kidneys flush out toxins. When you get hungry, think about what it means: it is a lot easier if you envision your body recharging it’s immune system vs. “I’m starving”. Check with your doctor before starting any major change to be sure that your meds don’t need to be adjusted, especially blood pressure meds and diabetic meds. US News: Does Intermittent Fasting Work? Hi Eileen, good post, just one caveat is that it is important sometimes to note that fasting and diet in general can affect medicines, and so it is important to check with “your” physician for advice when on long term medications, in particular, blood pressure medications and diabetes medications. You are right!! I will edit the post to reflect that.